Regulations are now available for Diss MCCs Muntjac Enduro in Thetford Forest. 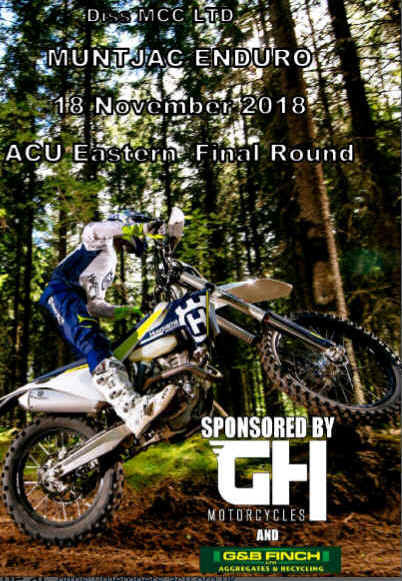 Whilst the event in not a British Round due to a clash with the ISDE, it is being run as an open ‘national’ event and also it forms the final round of the ACU Eastern Enduro championship. Organised by Diss MCC, this is one of the most popular long course forest enduros of the year. This is mainly due to the dry sandy nature of the forest which makes the terrain rideable irrespective of the weather conditions and rider capability. The course will be along similar lines to previous events with a 20-mile course and a 1.6 mile special test. The Championship class riders normally ride 5 laps with the test timed up to 6 times depending on conditions. The start time will be 09.00 with the test timed for Championship Class on laps 1,2 & 3 and then run back to back 3 times on lap 4. Experts should have 5 laps with 3 timed tests and Clubmen 4 laps with 2 special tests timed. As with all Diss MCC events held in Thetford Forest, it is important to get your entry in early to save any disappointment as it normally fills up within a few days of opening. Organisers, Diss MCC, are very grateful that the principal event sponsors Gavin Hockey Motorcycles and G&B Finch Aggregates and Recycling have agreed to continue their valuable support of the event.